A Chinese company called OnePlus has plans to introduce a smartphone under $400 and claims that it will have all the latest feature to beat iPhone in terms of both specs and software. OnePlus is going to introduce their OnePlus One smartphone this year and a lot of people have already showed interest in this upcoming smartphone of theirs even though OnePlus didn’t go through any heavy advertising. The OnePlus one will be a geek phone means that it will have a custom software which will be designed by CyanogenMod who is famous for making custom open world Android ROMS. OnePlus is also allowing users to freely root their phones and add any custom ROM they like without voiding their warranty, which means that there are no limitations to what you can do with the phone and still have a warranty to back you up. 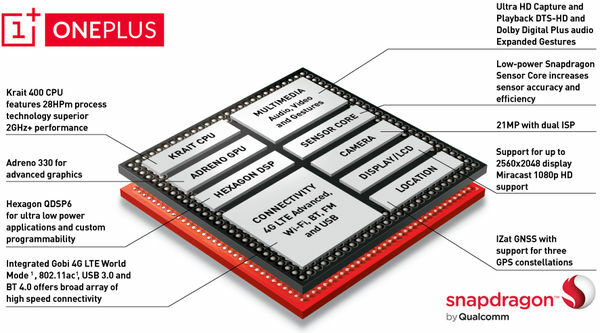 According to some latest rumors the phone does not reach to the hype that the CEO of OnePlus said it would as the phone will be equipped with a Qualcomm Snapdragon 800 processor which is a beast in terms of both benchmarks and performance but that was last year and this year a whole new bunch of SOC’s are arriving including the Snapdragon 805 and the Snapdragon 801 which is already included in Galaxy S5. We say this because the CEO said that the OnePlus One will be one of the best smartphone of 2014. The OnePlus One is rumored to have a 5-inch display supporting a resolution of 1080 and will come in 16 GB and 64 GB version, the reason why the company didn’t include a 32GB version is because OnePlus will be offering a 63 GB phone for the price of 32 GB and stereo speakers. Even if the OnePlus One doesn’t make it to one of the best smartphone of 2014, it will still be a nice phone to have under the price $400 with a powerful SOC and the freedom to run any custom ROM that one prefers. There is no news on when the smartphone will come out, we might see it in a couple of days or months.